Perhaps its a sign of the times. People take a whiff of exclusivity and get a contact high. Sadly, the bar has continued to drop on what makes up exclusivity. Just today, two nicely packaged letters came in the mail. One read “An Exclusive Invitation” and the other had “You’re Invited” printed nicely under the computerized calligraphy. Seeing that the Equinox gym and spa that is opening around the corner had sent the mail with “AN EXCLUSIVE INVITATION”, there were hopes that at least a favorable introductory rate was being offered inside. All that was offered was an invitation to “get on the list today” and a bunch of marketing images. There was no excitement about the new neighborhood. They did not offer a couple of free weeks or greatly discounted fees if you register before they open. It was just an invitation to get on the list – which seems like it’s not so much of an exclusive invitation. They spent a lot of money on the printing and the envelopes and probably also paid some outfit a premium to package them and send them to the targeted people in the vicinity of the new location. What looked promising became a complete turnoff because they promised something that they had no intention to deliver or thought the audience was so dumb they would accept that invitation as something special. The location also has something to do with it. In West Los Angeles, there are many who get exclusive invitations to many businesses and events that are truly exclusive (and usually have free or special rates attached). This mechanic can work in other locations or with other brands, but Equinox seems to be confused about the customer they are going after and how that relates to what they are offering. The Invitation with the calligraphy was not much better, but at least it was quasi-cute and probably didn’t cost as much. Additionally, there was nowhere that mentioned the word Exclusive. 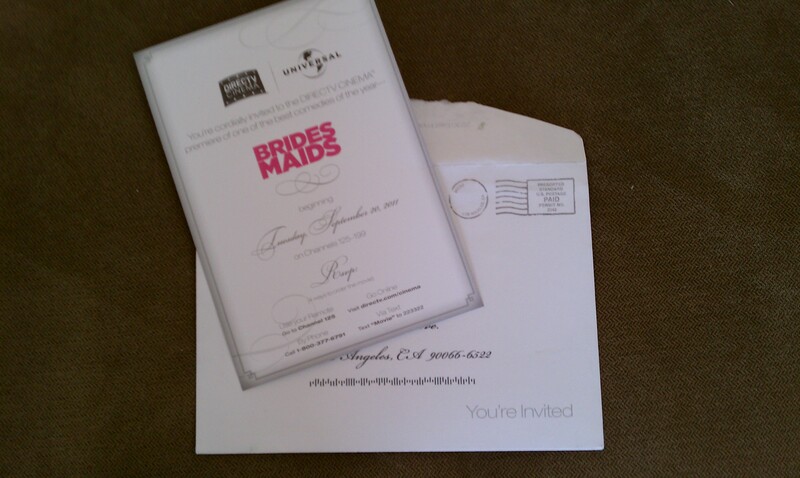 DirecTV and Universal sent out a faux wedding invitation to the premiere of BRIDESMAIDS on pay-per-view. There was no discount offered, just four ways to RSVP – via remote control, website, phone or via text. This one was more palatable for the reasons that it didn’t portend to offer exclusivity. It was consistent with the product and there was a true opportunity for consumers to get some real actionable information in both the premier date, location and the fact that there were multiple ways to order a DirecTV movie. The invite from DirecTV was not a real invite to an event like you would expect from a mailing like this, but it was certainly a better interaction than the Equinox one. It also was lesser quality in terms of printing, but more enjoyable. The Equinox invitation missed out on an ideal opportunity to generate good awareness about their pending arrival in the neighborhood. They didn’t even list the expected open date or where they will be located. It seems that this mailing is the template for them whenever they open a new venue, but its a shame that they didn’t offer more on the card dedicated to the specific location to more about the specific location. Even if you go to the url they list, it doesn’t list the open date or location address. It has the opposite effect of what they intended as it seems much less personal. Perhaps some will fall for the “Exclusivity” and believe something is there, but the worst that can happen is that your customer gets beyond the velvet ropes and finds that there is nothing there. As costs for mailings and other direct response mechanics increase, all businesses should be constantly evaluating the production costs and the returns and then questioning whether it may cause additional costs in lost prospective customers.